You’re watching a movie, and you see a police officer throw a “flash bang” distraction grenade through a window at one end of a house and simultaneously on the other end of the house a tactical entry team smashes in a door with a “battering ram” and rush in. Each officer’s rifle is up at the ready with his laser light on. With what looks like dozens of thin red lines of light flashing in multiple directions out in front of the entry team, the bad guy is arrested and handcuffed in seconds. In the tactical world this is known as a “Dynamic Entry”. This tactical maneuver was achieved by countless hours of rehearsal focused on speed, as well as overwhelming manpower and firepower. In other words the bad guy is either arrested before he can react, or he very quickly realizes he has no chance of winning a physical or armed response against such overwhelming odds, so he does not resist (most of the time anyway). You’ve been looking for something to help you enhance your home defense response plan; however, you realize you don’t have the time our resources to rehearse the physical dynamics that so impressed you in the movie, but you can attach one of those “kool” looking red lasers to your handgun or rifle. After all, if it helped the tactical team make that very quick successful dynamic entry, it should help you too. This would be true, if you were doing a dynamic entry with “flash bang” grenades, multiple tactically trained personnel armed with multiple tactical rifles. But, it’s just you, alone, trying to defend yourself and your family inside your home. Lasers also give your location away. There are two ends on every laser. One end looking for the intruder and the other end points right back at you. So, obviously you can’t use a laser, if you want to sneak up on someone especially at night or in a low light situation. Some proponents of the laser for civilian use talk about using the laser as a visual deterrent. Pull the gun, point it at the attacker, activate the laser, and when the attacker sees the red laser dot on his chest, he will change his mind about victimizing you. This sounds good, but the fact you already have a gun pointing at the attacker should produce the same effect, so why do you need the laser? Finally lasers are difficult to turn on and off under the speed and stress requirements of a real world gun fight. Let’s face the facts, it will take everything you have just to get the gun up and on target for multiple accurate hits as fast as you can, when you’re under the physiological effects that come with any life threatening situation. If you’re in a street concealed carry situation, things will get even more difficult, because you’ll have to draw the handgun and then get the gun up on target for multiple accurate hits, while you’re still under the physiological effects that come with any life threatening situations. 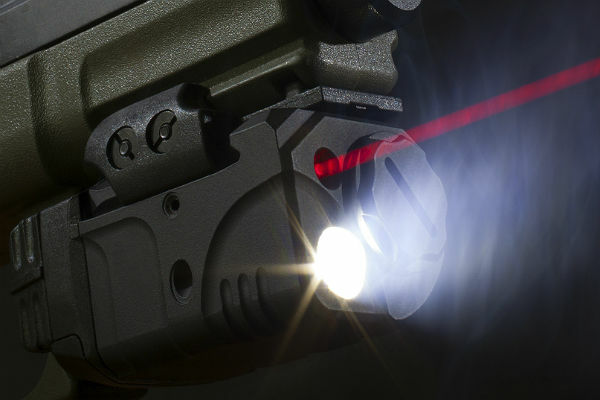 Lasers can be very useful and effective in dynamic tactical applications, but they clearly have some serious negatives, when it comes to use in a home defense or street concealed carry situation.